Know enough about the world to win at global trivia? It’s “Jeopardy” meets “Where in the World is Carmen Sandiego” when the World Affairs Council hosts its annual gala. The evening starts with cocktails and dinner, but the world trivia contest is the star of this event. Here’s how it works: Each table of 10 is a team. The game of global wits is a “friendly” competition, says World Affairs Council executive director Michelle Harpenau. But . . . there is a trophy – topped by a world that spins – so it’s no coincidence that many of those tables are stacked with global know-it-alls. In its first two years, the gala/contest grew from 110 contestants to 170, and organizers hope to top 200 this year. The lawyers won year one. Year two, a World Affairs Council board member won by stacking the table full of friends with high Global IQs. Coming up with the questions is a year-round quest for the volunteers and WAC staff members who put the contest together. And for contestants who want to bone up ahead of time, special study guides for the contest are available, said Harpenau. If that’s not enough prep work, study guides used by high school students to prepare for national competition are on the WAC website. The trivia competition is an extension of WAC’s global education program that begins at the grade-school level and goes on through high school. In the past five years, that education program has expanded from 500 students to 3,000. 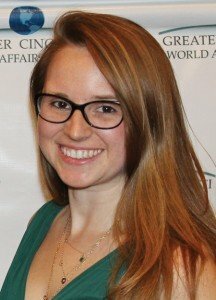 Harpenau, who graduated from Fordham University with degrees in international political economy and French language and literature, started with World Affairs Council in 2010 and has been executive director for 31/2 years. For international news, she turns first to the BBC, New York Times and Al-Jazeera, noting The Economist and Foreign Affairs Journal are on the short list for many of those serious about world affairs. Serving as an international resource.